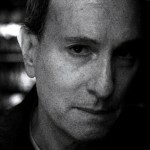 After completing his book Inconvenient Stories: Vietnam Veterans, Medic’s friend photographer Jeff Wolin traveled to Vietnam twice to photograph Vietnamese war veterans. 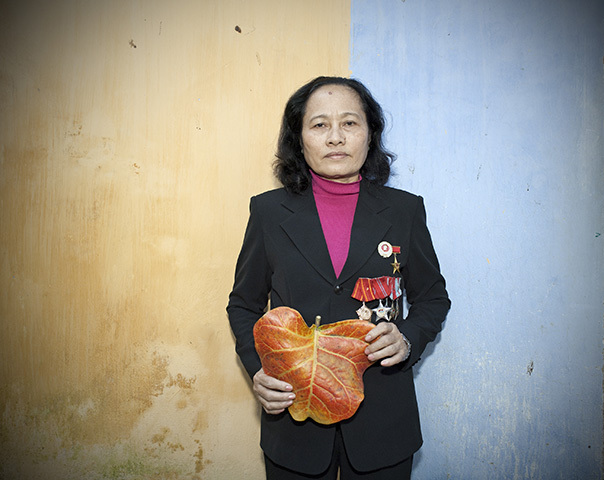 From All Sides: Portraits of American and Vietnamese War Veterans was exhibited in the US and abroad, and featured at the Photo Biennale in Lyon, France in 2010. 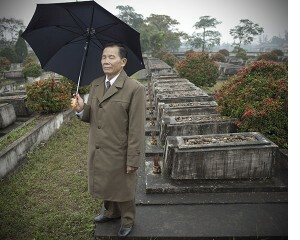 With Jeff’s permission here are five portraits of veterans of the Vietnam Peoples Army. “For three years I escorted the soldiers from the north to the south and the wounded from south to north. My unit was based in the jungle, one day’s walk from Da Nang, south of the DMZ. We carried the wounded on litters from base to base in the jungle. It took the whole day. We left in the morning from our base and arrived at another in the late afternoon. A soldier went ahead to clear a trail for us with a machete. Ten of us carried five soldiers. They were seriously wounded-some were missing limbs. It was hard for women. At first we marched south from Thai Binh province to the south, always on foot, through the jungle along the Ho Chi Minh Trail. We would rest every ten days and take a shower-every ten days. For women to go that long without a shower after walking in the jungle, you can imagine how hard that was. We had to carry everything-food, weapons-the same as the men. At that time I weighed 50 kgs. Many women volunteered during the war. I thought everyone should defend our country. It was hard work and also dangerous but I felt happy to do it. Many times we were in the area where B-52’s were bombing and sometimes we were surrounded by American soldiers. 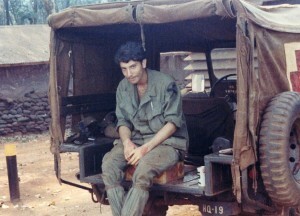 Once, in 1972, our unit was carrying wounded soldiers through the jungle in Quang Binh province when B-52 bombers came in and we had to move fast, carrying wounded and our weapons. That night soldiers from our unit, some of them women, were wounded, so they stayed behind until they could be retrieved. I was near the airport at Da Nang when the city was liberated on March 29, 1975. I went into Da Nang to join in the celebration on April 1. Everyone was delighted-I can’t describe how happy we were. The people of Da Nang greeted us and were very happy. The women wore ao dai, traditional Vietnamese clothing. They waved flags and threw flowers. We knew the war would soon be over. 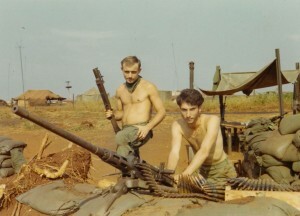 The jungle we operated in was sprayed often with Agent Orange. The trees lost their leaves and the people from that area told us it was because the water was contaminated by dioxin. Now my health is poor. My stomach is not so good and I have pain in my backside and up and down my legs, It started more than ten years ago. “During the Tet Offensive of 1968, I served as Chief of the Division to organize the plan for the Battle of RN 9 near the DMZ in Quang Tri province. The purpose was to stop the movements of the American soldiers so they could not cross Route 9, which ran from the coast to Laos. We had sent in regiment after regiment until we had the whole division in the area. Finally we got closer and closer to Dong Ha. Our unit faced difficulties. The American defenses were very strong and the area near the base was just sand with nothing to conceal our troops. So we dug in under the sand at night. During the day the sunshine made the temperature very hot. 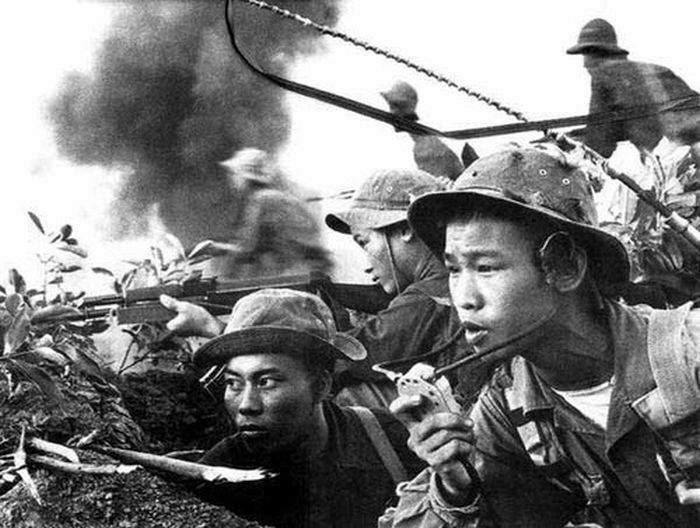 Everything was very difficult for the Vietnamese soldiers but we appeared suddenly and the Americans were surprised by our attack. The battle was Tien Tanh of Cua Viet-it means the surprise attack of the Cua Viet River. Our troops were buried in the sand the whole day and that night we came out and surprised the Americans. We knew very well the organization of the American defenses in the Cua Viet area, which was protected by an electric fence. The water level in the river was not so deep. The American side had artillery and bombs all day and even at night so to avoid that we went where the water was deeper. We attacked where the American bombs and artillery had damaged the fence. We went through the wires. We understood the schedule of the bombings and artillery and waited until they stopped. We took off all our clothes and crossed the river with everything carried on our heads. When we got across the bombing started again. Once we got to the other side of the fence we put our clothes on. 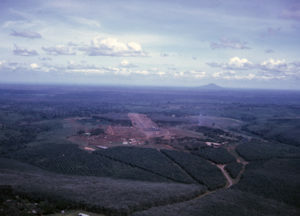 For months we kept the supply line cut to the American base at Khe Sanh. The Americans had to focus on trying to get troops and supplies to Khe Sanh. “In 1967, our unit attacked the base at Trieu Phong in Quang Tri province. It was a base of southern regime soldiers and American military advisors who were collecting information about our forces. My unit was Dac Cong, Special Forces. Our responsibility was to approach close to the target and attack. I was a 2nd Lieutenant at that time. A few days earlier we had sent soldiers to observe and make maps of the enemy positions. Using these maps we approached the base, which had twelve layers of barbed wire fence. On the other side of the base, another Dac Cong unit prepared to attack. We broke through three layers of fence but the fourth layer was illuminated by a bright searchlight. We couldn’t penetrate any further without being seen so we changed our plan. The Dac Cong unit on the other side of the base began their assault. A comrade and I began to throw grenades with string fuses to destroy the fences. We got close to one watchtower when the soldiers inside began to open fire and threw a grenade at us. I jumped aside as it exploded and then threw my explosives inside the watchtower. A piece of shrapnel hit my back. When we had gotten past the first layer of fence I stepped on a pungi stick, which slightly injured my foot. So I was injured twice in the battle. After I was hit by shrapnel, the Saigon soldiers counterattacked. I ordered my troops to shoot out the searchlight but they couldn’t so I took a B-40 grenade launcher without the round, quickly climbed the tower and smashed the light so we could withdraw without being seen. As the unit leader I accepted the possibility of my death in order to protect my unit. My comrades carried me out since I was wounded. I was taken to a hospital in the jungle for one month and then spent three months in rehabilitation at another base in Quang Tri. I was awarded the status of National Hero of the Army. “I joined Biet Dong, the resistance force in the cities of the south, in 1966 when I was 16. As a cover, I worked in Da Nang as a housekeeper for a family that owned a construction business. I cleaned the house and took care of the children. But my real mission was to dig bunkers in safe houses to hide weapons I smuggled in along with other girls in Biet Dong. We guided soldiers into Da Nang and found bunkers for them to hide in. The family I was housekeeper for did not know of my work for Biet Dong. After a year I had to tell them the truth: that I had joined the army to fight for liberation. They had suspected something was wrong, with so many people coming and going all the time. I asked them to support my mission and they agreed. 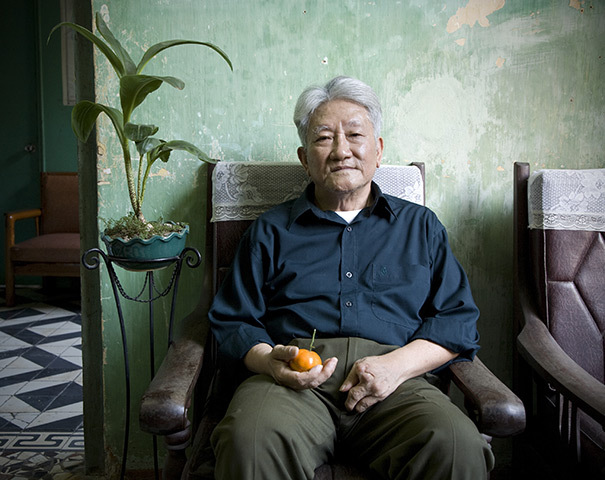 Before Tet in 1968, the police suspected me and I was arrested on the street and held for 15 days. They questioned me but I told them I was just a housekeeper and didn’t say anything about my real work. I was tortured but told them nothing. On the morning of December 26, 1968, I was at the house of Mother Nhu in a bunker under the floor. 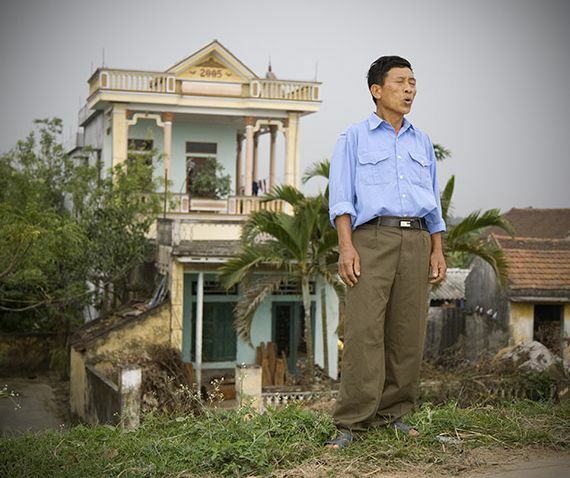 A spy had denounced Mother Nhu and police surrounded her house. They broke in, arrested her son and beat him. He didn’t say anything and they took him away. Then they arrested and beat Mother Nhu. 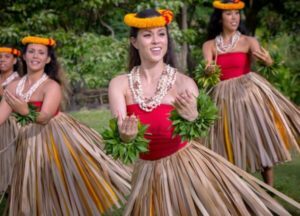 She also revealed nothing about her activities for Biet Dong. The police shot her in her home. I was hiding in the bunker with two other soldiers. We could hear everything that was going on upstairs. After they killed Mother Nhu we burst out of the bunker and threw grenades at the police. Some were killed immediately as we fled the house. There were many police in the area and a helicopter overhead told us to surrender. The police shot tear gas to try to capture us but we fired our weapons at them. American soldiers began to chase us too. While we were running, one of my comrades was badly wounded. We tried to carry him but he said he couldn’t move. He asked for two grenades and we left him. As the police and soldiers approached he detonated the grenades killing himself and several soldiers. We walked the Ho Chi Minh Trail through Laos to get south of the DMZ. I was in Da Nang, Quang Ngai and Quang Tin. We lived in tunnels during periods of bombing. Otherwise our quarters were built half-below and half-above the ground and we stayed there when there was no bombing. It was in a thick forest. We weren’t worried about being attacked by ground troops. The tunnels were “A” shaped, 2-3 meters deep and 3-4 meters wide-we could walk upright in them. There were many tunnels-they were connected by trenches dug into the ground but uncovered. During battles I would fight as a regular soldier-I had an AK-47. But when someone was wounded I was a medic. I would give them something for the pain, dress their wounds and help carry them back to the base for further treatment. Sometimes the American helicopters would fire rockets at our base but they never hit near the hospital. They never found our tunnels in that thick forest. In that part of Vietnam during the monsoons we got heavy rain. One time two of us were carrying a wounded comrade on a litter and it was raining very hard. A helicopter shot at us. We hid my friend by the base of a tree and covered him with our bodies to protect him from the rockets. I was hit once in the head with shrapnel but it wasn’t serious. If someone died we also carried them back four or five hundred meters from the battle zone where someone else took care of the body. The dead were buried in the south and a map was made of the graves so families could locate their loved ones later and give them a proper burial. During the war we didn’t have enough food to eat so our bodies were not as strong as usual. We all got malaria but we didn’t have enough medicine to treat the disease. It took until two years after the war before the malaria was completely gone from my body. I lost all my hair; my eyes turned yellow and my skin green. All of us caught the disease. We had to fight anyway.